I have had a lot of John Deere mowers and multi grade will go out the valve guides,and the more hours,the more oil will go out,that’s why they recommend straight grade oil in air cooled motors,Onan can use multi grade in the winter to allow them to turn over better when cold,but expect oil usage,mine uses John Deere Torque Guard Diesel oil 30 weight. John,I’ve had valves stick in the Briggs motors and pull out the guide,what I do is run some used oil in the gas for lubercating the guides,half qt in tank,they aren’t fun to fix. Love chasing white lines but they are difficult to catch.Hate drivers with no STOPLIGHTS. I will start doping the gas with TWC3 or MMO then, or a few drops of the 'new oil'... don't want the valve guides to stick on this thing. then in Fulton, MS the exhaust header flange at the end of the headers, where the tail pipe bolts up to the headers.... that flange just slipped right off the header pipe.... did not look like it had ever been welded from OEM. took an hour for the backwoods shop to fix that, but it don't leak or pop anymore. we stayed at the state park in Fulton, MS for 3 days. nice place. 55 minutes and we rolled out with a new alternator. Good folks in the backwoods. then just east of Alma, AR the front tires were bouncing so bad, that I decided we had to them replaced..... a result of a huge hole in west I-240 at Memphis, TN.... busted belts in the left front tire. so, 2 new tires, and Cyndi drove us home.... I was finished for the day. went to sleep in the right seat. Last edited by AZgl1800; 04-15-2019 at 06:49 PM. 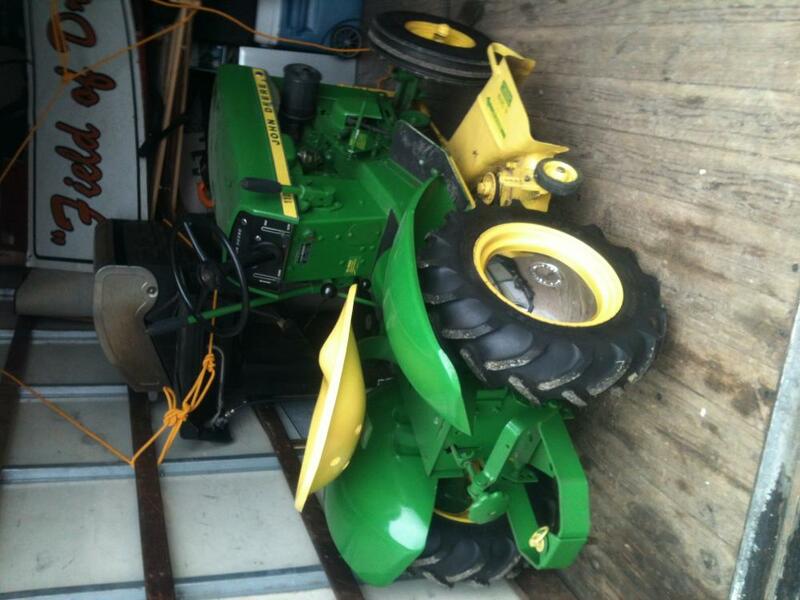 What engines are in those John Deere mowers? I have one with a Kawasaki engine. If that engine has a pressure oiling system with a filter, I would go with oil such as the torqueguard 30w. Dipper/ splash oil systems should use the non-detergent. Pressure/filter systems should be detergent oil. Google “Briggs Stratton stuck valves” for some reason the do and it usually the v twin. just verified that, so I will take pains to be sure it does not do that. I only use Pure Gas 87, never use ethanol. it fired right up tonight and Cyndi mowed 2 acres with it. That's a nice one. Mine is a 1987 model so I guess that means it "newer". this is the typical aircooled engine, it is a V-twin Vertical Shaft, horizontal cylinders in my Husqvarna 48" deck lawn tractor. and the lowly tractor is on SAE 30w non-detergent. now tell me why, it should be non-detergent? why not use a multi-weight in it too? according to your expected operating temperature. so, stick with the SAE 30 non-detergent? I use quality detergent oils in my B&S engines, often straight 30 wgt but 10w30 is OK in my one Vanguard V twin as it has pressure lube and filter. 30wgt OK in splash system. Not so sure about switching over from Non-Det to Det at 550 hours though, and if I did … I'd do next few oil & filter changes more frequently. I also check oil levels before each start. My gen has a OHV 13 HP B&S, but my 1981 Wheelhorse is on B&S V Twin #2 … it came with single cyl Kohler but that was underpowered and tired, so I swapped to Vanguard and then accumulated grass in cooling fins led to overheated rear head …. so I replaced again with another new one. I also upgraded deck 20 years ago, from 36 to 48".